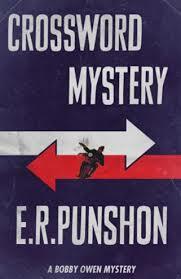 In E R Punshon‘s Crossword Mystery, Mr George Winterton, a stockbroker and monomaniac on the subject of the gold standard, is in fear of his life. His brother has recently drowned, all his comfort in the peace of the English coastal bay which they own has been ruined, and he has demanded personal protection from the police. They send Bobby Owen, an attractive ex-Oxbridge detective constable in his third Punshon mystery, who wears his newest expensive suit to ride a motor-bicycle across country. He’s the prepared type, keeping a knotted silken rope hidden in the false bottom of his suitcase, all the better to climb out of windows at midnight with. This is a novel from the period in which the numbers of bank notes could be traced to whom they were issued, and missing telegrams could be resent to check what they said. It’s an ingenious and pleasant read, and an absorbing one from the halfway point, after the murder, when the detection really gets going. There’s more attention paid to the unravelling of the puzzle, in this vintage detective novel from the 1930s, than to characterisation. The story trots along like an eager layer of a trail of clues, looking behind rather too often to urge the reader on and encourage their guesses. We are offered some very clearly-labelled red herrings and some excellently hidden crucial clues. The proliferation of leads in the second half is quite bewildering, in the best possible way. One unusual aspect to the novel are the remarks by characters about the rise of Nazism in Germany, made part of the plot by a rather uncomfortable anti-Semitic speech by a character whom we are supposed to receive sympathetically. Matched to this is the subplot of the English seaside resort, an investment plan for which only English goods will be bought, and being only for the English. It’s a covertly nationalist ideal, rather too close to German politics of the period, presented as a controlled utopia in which a benevolent dictatorship will encourage the respectable English to gamble on barges out at sea beyond the legal limit. In hindsight, there are some odd ideas wandering around this novel, accepted as completely normal in a closed society, but it’s harmless entertainment, and an excellent way to get through a dull journey. I think the German and the English businessman are presented ironically by Punshon. That the part Jewish German victim of antisemitic persecution still desires to be considered “pure Nordic” makes him a rather pathetically deluded character, as I see it. When Punshon has him referring to how as an extenuating circumstance in his favor (in his view) he gave the Nazi salute to “high-spirited young Storm Troopers kicking an aged Jew into a canal, and then pulling him out to kick him in again,” I think Punshon’s scorn is fairly withering. 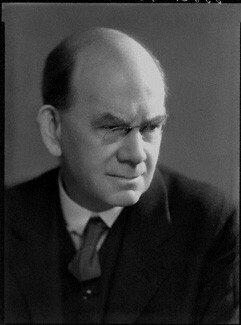 Punshon, a columnist for the Manchester Guardian, was quite critical of the rise of totalitarianism in Europe, in both its fascist and communist forms. I agree that Punshon is a very early public critic of the Nazi regime through his fiction, but I’m not so convinced that that character was intended to be quite so deluded. I was expecting him to be ironic or negative symbolic commentary, if you like, but was rather taken aback at how convincing his dialogue sounded. But it’s a minor point: the important thing is that Punshon actually wrote a character saying something at all, when so many writers at this moment in history ignored Nazi aggression.